If you use Google+ and Gmail, Google is about to open your email account to a whole new level of spam. A new feature rolling out over the next couple of days makes it possible for any Google+ user to email you, as long as they follow you on Google+—they don’t need to know your actual email address, and you don’t even have to follow them back. And to make it even worse, Google took the Facebook approach by turning on the new feature by default. Fun, right? Not so much. I’ve already got this new “feature” in my inbox and the first thing I did was turn it off. Today, I’m going to show you how to do the same thing. But first, let’s cover the basics about how this new “email via Google+” feature works. Even though any Google+ user can crowd your inbox now, they won’t know your actual email address unless you reply to their message. Plus, Google+ users who aren’t in your Circles (read: you aren’t following) can only email you once without your approval. When someone from your Circles emails you, it shows up in your Gmail’s “Primary” inbox tab. If the message is from some random Google+ stranger, the email gets filtered into your “Social” inbox tab. The other good thing is that if you want to keep the “email via Google+” feature, you can restrict Google+ emails to just people in your Circles or your extended Circles (which functions like Facebook’s friends of friends). Got it? Good. Let’s get down to business. When the Settings panel opens, scroll down the “General” tab until you see “Email via Google+” label. (If you don’t see the new setting in your Gmail account, check back over the next few days, as the feature is still rolling out to all Gmail users.) Click on the drop-down menu and choose the setting that you’re most comfortable with. Remember, by default Google is letting anyone from Google+ send you unsolicited mail. I chose to stop Google+ emails completely by selecting “No one,” as you can see below. After that, Gmail kicks you back to your inbox. Congratulations, you’ve beaten back a potentially serious case of Google+ spam. Restore using iTunes: You can also try restoring your iPhone via iTunes. Plug your iPhone into your computer using your USB cable, and select your iPhone from the source list. Go to the Summary tab, and then select Restore iPhone: This will create a backup of your phone’s settings, and then download and install a fresh copy of iOS and revert your phone to default settings. You can then put your data back on your phone by selecting Restore Backup from under the Backups heading. Force-close an app: If you need to force a hung app to close, go to your phone’s Settings app, then tap Apps. 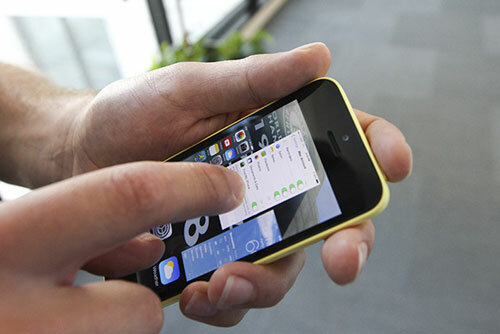 Swipe over to the Running tab, select the app you want to close, then tap the Stop button. If you don’t see the troublesome app in the list, tap the Show Cached Processes toggle in the upper-right corner of the screen. Restart your phone: Restarting your phone can help clear up stubborn problems. To do so, hold down your phone’s sleep/power button for a few seconds until it asks you if you really want to turn off your phone. Confirm that you do, and your phone will power off. Once it’s off, hold down the power button again until the screen turns on; your phone should be up and running again after a few moments. Force-restart your phone: The standard shut-down-and-restart method may not work if your phone is frozen, in which case you may have to force your phone to restart. Unfortunately, it’s a little more complicated on Android than it is on iOS, because different phones may have different hard-restart methods. You can force many Android phones to shut down, however, by holding down the power button and volume-up button until the screen goes dark. From there, power on your phone again by pressing the power button for a few seconds. If the volume-up button doesn’t work, try the volume-down button. If this doesn’t work, refer to your phone’s documentation. Remove the battery: If your Android phone is frozen solid and it has a removable battery, the easiest way to force-restart it is to simply remove the battery. Pop off the battery cover, remove the battery for a few seconds, put it back into place, snap the battery cover back on, then turn your phone back on by holding the power button down for a few seconds. You should use this method only if the standard method of powering off and restarting your phone fails, however. Restore to factory defaults: Maybe you decided that trying to troubleshoot an issue just isn’t worth the hassle. If so, you can reset your phone entirely and restore it to factory defaults. To do so, open your phone’s Settings app, scroll down, and tap the Backup and Reset menu. Next, look for Factory data reset, and tap it. Your phone will ask you to confirm that you want to do the deed; once you do, it will restore itself to pristine, fresh-from-the-factory settings. LAS VEGAS—Asus is adding another dual-OS convertible to its stable. The all-new Transformer Book Duet TD300 is a laptop/tablet convertible that can instantly switch between the Windows 8.1 and Android 4.1 (Jelly Bean) operating systems with the push of a button. The tablet’s IPS touchscreen has native resolution of 1920 by 1080 pixels. The tablet has a microSD slot and a headphone jack, but no USB ports. The keyboard/dock has one USB 3.0 and two USB 2.0 ports, 10/100 mb LAN, a headset jack, and HDMI 1.4. The device also has up to 1TB of mechanical storage. The tablet and keyboard weigh just over 4 pounds combined. 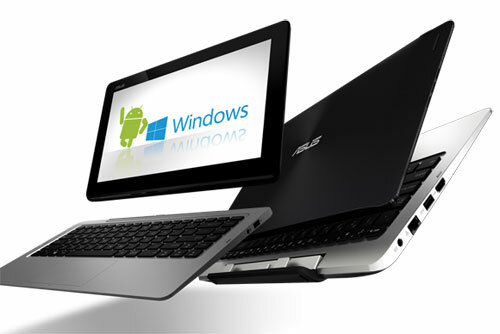 Asus’s earlier notebook/tablet hybrid—the Transformer Book Trio—can also run either the Windows or Android operating systems. But that device had an Intel Atom processor in its tablet, and an Intel Core processor in its keyboard dock. The tablet had to be removed from the dock to run Android, and it had to be paired with the dock to run Windows. Or you could connect the dock to an external display and run Windows independently of the tablet. But Asus muddies its own marketing message by describing the Duet as a “quad mode” laptop and tablet. The concept they’re trying to get across is that the device can operate as either a Windows or Android tablet, and it can also operate as either a Windows or Android notebook.